The gorgeous Gal is filling Wonder Woman's shoes, and joined Ellen for her talk show debut! 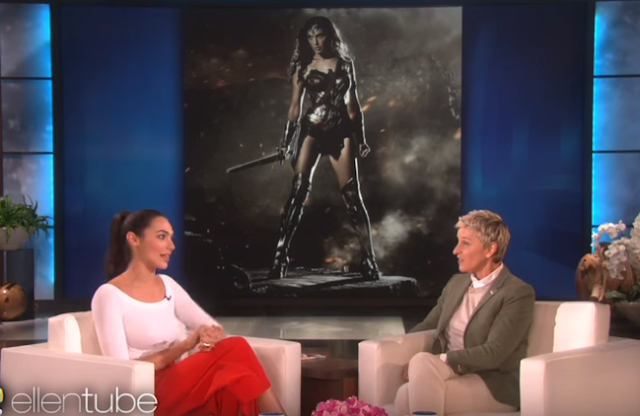 With 'Batman V Superman: Dawn of Justice' premiering next week, Gal Gadot has begun doing interviews and her first stop was The Ellen Show on Tuesday. Host Ellen Degeneres asked her a number of things and discussed how Gadot got the role of Wonder Woman, her solo film as the Amazon princess, and what her daughter thought about it. “I did an audition, I didn’t know what I was auditioning for,” Gadot told DeGeneres, explaining she wasn't given any information about the role as she first read a scene with Batman V Superman director Zack Snyder. “And then they call to say that they want to camera test me with Ben. I said ‘Great, what am I testing for.’” Gadot finally learned later that night what role it was when Snyder called her. “Same night, caught to Zack calls me, saying, ‘Well, I’m not sure if you have it in Israel but did you ever hear of Wonder Woman?’ Then I went dead for five seconds, came back to life, and tried to pull off my coolest voice, saying ‘Wonder Woman? Yeah, yeah, I’ve heard of her,” she said. Two weeks and 30 missed messages later, Gadot learned she got the part as soon as she landed from a long flight to the U.S. from her home in Israel. Gadot reveals just how important playing Wonder Woman is when she shared an anecdote about her daughter's thoughts on princesses. One time I was telling her a story. And she says, “The prince is always so brave and courageous and strong.” And then I ask her, “Well, what do you think about the princess?” She said, “Meh.” I ask her, “Why do you say that?” And she says, “They always fall asleep! Then the prince is the one to wake them up. And they do nothing.” … Anyway, it made me feel good about playing Wonder Woman! Obviously, unbeknownst to her young daughter, Wonder Woman is not a "do nothing" princess and very much awake. The character has been a feminist icon for over 70 years and girls have found inspiration in her fierce independent spirit. She's finally getting the big screen treatment she deserves after years of seeing her DC Comics counterparts, Batman and Superman, get theirs over and over again. Gadot makes her debut in 'Batman V Superman: Dawn of Justice' on March 25, her solo film, 'Wonder Woman,' is scheduled for release in 2017, and she'll also appear in the 'Justice League' films.